Okay, this one seems a bit out there. 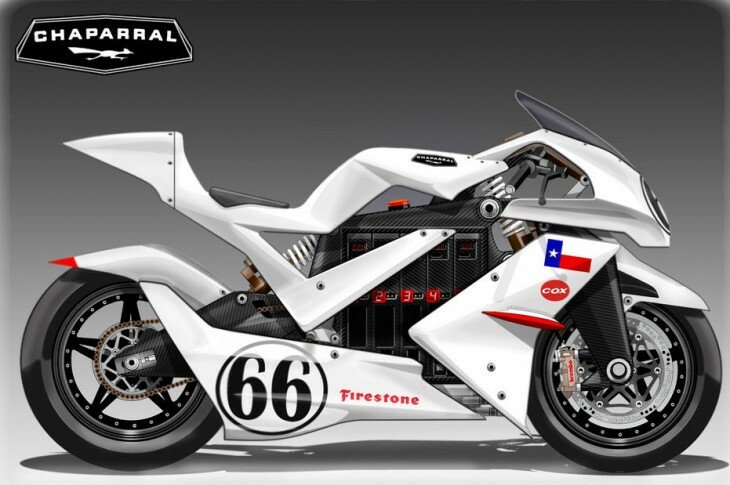 Could the automobile racing great Chaparral introduce an electric motorcycle featuring Firestone motorcycle tires? We have our doubts, but our Italian friend Oberdan Bezzi thinks it could happen, and provides these two concept drawings. Dreamed of winning the lottery and creating such a project. Electric bike with Hossack front end. Just glad to see there are still people with vision, instead of the same old same old. Would of been nice to see this drawing ith a Brakko front wheel. Got these pics as my desktop and I’m knocking 50 there is still the kid in me some where. They keep publishing because lot’s of people enjoy looking at it. He does excellent, clean artwork, and I don’t see why anyone who likes motorcycles or mechanical stuff in general would not like his work. It just doesn’t add up. Someone might be on crack, but I seriously doubt if it is Bezzi. It isn’t likely that someone on crack could do the excellent artwork that he does. It goes without saying, of course, that someone on crack would have no difficultly posting a comment of the sort that you posted. Not to suggest that you are on crack. I would never, ever accuse someone of being on crack unless I knew with absolute certainty that this was the case. Just another example of the downside of sites like this permitting the public to post comments on their site. Sigh. What a waste. As a professional artist myself, I like Bezzi’s work. I just don’t care for an “electric” concept. I think some people that use comments like you referred are the ones on drugs. There’s more Chaparral A1 e-RACER at motosketches.blogspot.com check it out! I think Jim would be rolling over in his grave with an electric motor in anything Chaparral related. I already miss the sound of that big block chevy! Parden my sarcasm, but I’m sure everyone with a high powered internal combustion motor is jealous! NOT! Agreed. I think these serve as filler when there’s no real news. Or in other words, when the horse you are offered is free, do you complain about its teeth? I really, really abhor that term “mental masturbation”. It seems to me that you just get some sort of satisfaction from using this particular description, and that you are prone to use it when given any half decent reason to do so. It is highly derogatory, and shows an utmost lack of respect to the person to whom it is directed. Whoever it was who first thought this up was a person of exceedingly poor taste, and it is unfortunate that other people would choose to emulate that sort of behavior. Web sites such as this one permit people such as us to make comments, because we tend to visit sites where we are allowed to throw in our two cents worth to our hearts delight. I think it is a privilege that many people take excessively for granted. I cannot think of a single semi-intelligent reason why the description you used is particularly applicable to what Oberdan does. I do not like these particular concepts, but he is extraordinarily good at what he does. Whether you do or do not like his concepts, you can’t argue that they are extremely well done, and that he is an extraordinarily talented artist. I appreciate his work, and I appreciate the fact that occasionally when I visit this site, I get to look at one of his newer concepts. Maybe you’re reading it wrong; who says ‘masturbation’ has to have negative connotations? Perhaps Mr. Bezzi had this idea all backed-up in his head, causing him to be distracted from working on things that might actually bear some future fruit. Rather than allow his frustration to build, he decided to churn out a few drawings in hopes of gratifying some inner urge. While he’s inked the page with something our readers may describe as a useless, ugly white mess, it’s possible that when the creator looks at this, he sees relief. I believe Obiboi’s latest addition to the Chaparral A1 e-RACER folio at motosketches.blogspot.com would indicate your assumptions are incorrect and that this is in fact a complete artistic concept like everything else the man does. I’m not ready anything wrong. The comment is meant to be overtly derogatory. This could not possibly be more obvious, and it is disingenuous for you to suggest otherwise. It could be that I’m full of _it. But, once again, that just provides an opportunity for me to feel better later today. Why in the world would you eve look at this rendering if you already know you don’t like anything that Obiboi creates and what does that likelihood of a particular creation reaching production have to do with anything. I usually like Oberdan’s concepts, but I have to skip on this one. The instant that I glanced at the one with the panels attached, I was reminded of the original Suzuki Katana, which I have always thought was one of the very ugliest motorcycles of all time. I expect that other people will wonder why this even reminded me of that bike. The part that did this to me is the part where the rider’s knees will rest, just to the rear and below the part that most nearly corresponds to what would be the fuel tank on a gasoline-powered motorcycle. The shape of that part, and the way that it is separated from the part that corresponds to the fuel tank, just reminded me of that hideous Katana. After looking at it more, I realize that this concept has next to nothing in common with the Katana, and now I feel better. But I still think it is ugly. Why not integrate the drive motors directly into the hubs of the wheels? Two wheel drive anyone? This would also provide a mehcanism for regenerative braking; perhaps the front brakes could be entirely replaced with the front motor. Why not? I know that this would increase unsprung weight, but they are, after all, concepts! And to think that all these years I have been laboring under the assumption that there is no such thing as a stupid question. Okay, I’m just trying to have a little fun at your expense, and probably should not have. Concepts are not expected to have all bugs worked out, but they are expected to honestly reflect what is honestly doable in production. A concept bike could have motor/generators mounted in the wheels, but it is not as though this has never occurred to anyone. No one would take it seriously, because in a production bike, it would mean that the wheels are made large and heavy. Ride quality would suffer, and handling would suffer. Many decades ago the sliding fork became the de facto standard front suspension, and the primary reason for this, in lieu of alternatives that had other advantages, is that the moment of inertia about the steering head axis is less with a sliding fork than with the alternatives. Stan, that’s way too much weight to push out to the ends of the bike, along with the unsprung weight, would just ruin the handling. Mass centralization is very important for a good handling motorcycle. Seems to me that Jim Hall’s creations were always electric…..it was a slot car version, and maybe a cox kit; High wings and low fins, ducttive fans to enhance downforce….to really be a “66” that Bike needs some wings or fins…..
…or replace the whole front fairing with a great huge fan. Never have to worry about controlling a power-wheelie again! 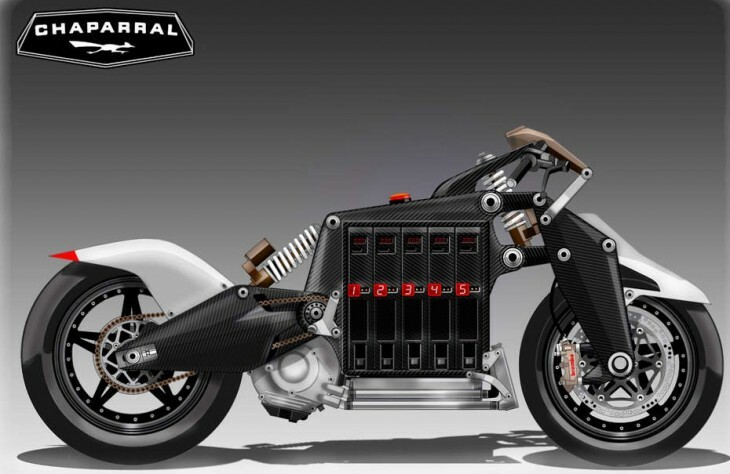 I’m surprised that electric motorcycle concepts have not used compact transmissions in order to keep the electric motors running at lower speeds (in their best torque range). I would think it would be easy to integrate an electric motor into the place of a gas engine/primary drive cog which should make practical production easier too. Interesting. I do not know, off the top of my head, the extent to which torque in electric motors decreases with increasing speed. I would be surprised if it is very much, since the only apparent reason why this would occur at all, would be magnetic hysteresis. I will hazard a guess that to the extent that this effect is significant, it is fully mitigated by using a single reduction that applies at all times, as opposed to multiple gear ratios. As such, there should be no reason for a gear box per se, the purpose of which is to permit multiple, selectable gear ratios. But there is of course a reason for the motor to run at higher speed, notwithstanding the potential loss of torque that is potentially due to magnetic hysteresis. The reason is of course that having the motor run at higher speed, power is made greater, because power is the product of torque and rotational speed. Wheel torque and acceleration are in direct proportion to power (notwithstanding that the proportionality between acceleration and power is speed-dependent). In other words, the reason for having the motor turn fast is that by doing so, wheel torque is made greater. If this is not apparent merely from the fact that power is made greater, you can approach it from the understanding of the fact that when you apply gearing and change rotational speed by some given factor, torque always changes by the inverse of that same factor. The product of torque and rotational speed, i.e., power, remains the same, except for frictional loss. A locomotive electric motor is not operating over a very wide speed range so the lack of torque at (relatively) higher speeds is somewhat masked by the inertia the train has already developed. The diesel generators for the batteries are already set to a fixed speed to maximize torque/charging capabilities. With a necessarily smaller motor for motorcycle use, a transmission would help keep the motor in its riches part of the torque curve (similar to a gasoline engine) albeit with different gear ratios. And since all current production motorcycles already have transmissions and final drive mechanisms it should be an easy retrofit. I appreciate that link and the enlightenment. But a couple of comments. First, it makes no sense to want to operate the engine at engine speed where its torque is greatest, i.e., at low engine speed. It is the same as with a gasoline engine and a continuously variable transmission, where the ideal engine speed for maximizing acceleration is the power peak, not the torque peak. The torque that matters is torque at the wheel, and you maximize wheel torque by maximizing power. There are two easy ways to see why this is true. #1 – Power is the same at the wheel as at the engine (except for frictional loss), and from this it follows that wheel torque is equal to engine power divided by wheel rotational speed and vehicular mass. #2 – Power is the rate of energy transfer, which definition is fully equivalent to the more popular way of defining power as the rate at which work is being performed, and when the rate at which vehicular kinetic energy is increasing is maximized, the rate at which velocity is increasing is likewise maximized. With that cleared up, your original point is correct, i.e., there would be an advantage to using a transmission to decouple the speed of the engine from the speed of the wheel and the vehicular speed, but agains as long as it is correctly understand that the goal is to keep the motor at the speed where power is maximized, which occurs precisely at 50% of its no-load speed. However, it is not at all clear that the benefits of using, say, six discrete gear ratios would be nearly as great as it is with a gasoline engine. If you study that power curve, you will see that in order to keep power within 80% of its maximum value, the motor speed can vary from about 150 rpm to nearly 450 rpm, which is a range of 3:1. To similarly keep power within 80% of its peak value in a gasoline engine, the relative range would probably be less than half this wide, i.e., no wider than perhaps 1.5:1. This is a crude guesstimate of course, but the point is valid, i.e., that the number of discrete gear ratios that you would need, to keep power within the same percentage of its peak value, might be only about half as great as it is with a gasoline engine. If you allow even further drop in power from its peak value, i.e., use 50% instead of 80%, this effect likely becomes even more pronounced. Darn it. In the first paragraph above, where I wrote: “no sense to want to operate the engine ..”, I should have written “motor” instead of “engine”. Actually all of the electric motorcycles I have seen so far have excellent speed ranges without transmissions. The torque curves in the article you cites contains no actual measurements on the graphs The graphs are notional and are grossly exaggerated (the slope of the curve especially). So I think if a transmission was needed you would have seen it on the TT electric race bikes The GM EV1 had the motor directly driving the single-speed reduction gear (i.e. fixed gear ratio) no transmission with multiple gears. There is no multispeed gear-shifting. (no transmission) Toyota’s Hybrid Synergy Drive also uses a fixed gear ratio (no transmission). Now a transmission in a electric car is feasible and Tesla is working on a two speed version (it has bugs) but the current models have only one speed enabled. 100% similarity of so called “external characteristic” curve of the vehichle. gear box at all. Just reasonable one reduction gear to down ratios per minute. Yes, the fact that all (or virtually all) electric and hybrid vehicles do not bother with anything more than a single fixed ratio between the drive wheel and the motor is compelling evidence that a multi-ratio transmission is not needed. I want to try and summarize a point or two. For a given mass, acceleration abides by a fixed proportionality with the ratio of power to velocity. For a given mass, the greater the ratio of power to velocity, the greater the acceleration. Within any given gear, this ratio takes on its greatest value at the same point where torque has its greatest value. The thing about this stuff that many people seem not to understand is that, at that point where torque is as great as it is going to get (and ditto for the ratio of power to velocity), if you have the ability to alter the gearing ratio so that the motor will spin faster, such that power is increased to the detriment of motor torque, then wheel torque and acceleration will increase notwithstanding that engine torque or motor torque will decrease. This fact is the essence of the correct understanding of this torque vs. power business, and this fact is obfuscated as soon as anyone starts talking about what happens “in a given gear”. Whether you design for a single gearing ratio or a set of discrete ratios, the goal is to cause power, not motor torque, to be as great as possible for as broad a range of vehicle speeds as possible. The original question misunderstood this. Consider the simple case of a single, fixed ratio. If you were to choose a ratio that keeps motor speed low in order to maximize motor torque, then wheel torque would suffer as a consequence. There is more than one way to understand why this happens. One such way is to realize that when the ratio of motor speed to wheel speed is low, the ratio of wheel torque to engine torque is also low, because these two ratios are the same ratio. Another way to look it is to realize that wheel torque is equal to power divided by wheel speed, and that power depends as much on motor speed as on motor torque. Thus, rather that choose a ratio that would keep the motor speed low, you would do much the opposite, except to avoid the situation where you would run out of torque too early and be left with little or no passing power at highway speeds. You could probably go about selecting an appropriate ratio by thinking only in terms of wheel torque, but to my way of thinking, the power perspective is more direct notwithstanding the fact that you have to keep in mind that you need more power at high vehicle speed than at low vehicle speed to achieve the same acceleration at both low and high vehicle speed. Keeping that in mind, I would select a ratio whereby power is maximized for a typical highway speed. Subjectively, I would desire to improve the passing ability as much as I can for a vehicle speed in the vicinity of 60 mph, which would mean that I would choose that single ratio such that the motor’s no-load speed will coincide with vehicle speed twice that great, i.e., 120 mph, taking into account the wheel radius. Now, at this point the question becomes whether it would make much sense to add a second gear. Doing so would not improve matters at 60 mph, because I have selected the ratio such that at this vehicle speed, I get the best performance from the motor that I can possibly get from it. But in doing so, I have chosen a ratio that causes performance at low vehicle speed to be less than what it might otherwise be. Acceleration at low vehicle speed will still be stronger than at 60 mph, because motor torque declines steadily from low vehicle speed to high vehicle speed, but the fact remains that performance at low vehicle speed is made less than I could otherwise have made it, by virtue of my having selected the ratio so that performance at 60 mph will be as great as it can be made, at that vehicle speed. Thus, the question of whether I want to add a second gear ratio reduces to the question of how badly I want acceleration at 10 mph to be even greater than it is. When considering that question, the first fact that occurs to me is that acceleration at 10 mph is already six times greater than acceleration at 60 mph. The key underlying fact is the fact that motor torque decreases in a steady, linear manner from low rotational speed to high rotational speed. Because of this fact, it is invariably true, even when a single gear ratio is used, that acceleration will be better at low vehicle speed than at high vehicle speed. When you consider this fact alongside the fact that using more than one ratio will not permit you to make power at 60 mph (or any other vehicle speed that you select) any greater than you can make it when using only one ratio, the justification for using more than one ratio seems very weak. If the acceleration at 10 mph, which already is six times greater than the acceleration at 60 mph, is not as good as you want at that vehicle speed, then it is more than likely the case that acceleration at 60 mph is a far greater problem than acceleration at 10 mph, in which case you need a bigger motor and bigger batteries. The question that was posed was oblivious to the fact that as you alter the ratio of wheel speed to motor speed in order to keep the motor torque high, that in doing so, you cause wheel torque to decrease relative to motor torque. Time and time again I encounter comments, in various motorcycle and automotive forums, that imply that the person making those comments does not understand that as you change the gear ratio so as to keep engine speed adequately low, that you necessarily and consequentially cause wheel torque to decline in relation to engine torque. I would wager that fewer than half of motoring enthusiasts understand this. Anyone who does not understand this can take comfort in knowing that they are in good strong company. Do any of these electric motorcycles have regenerative braking? Not that I’ve seen, at least not on the front wheel where most of the stopping happens. Ordinarily, regenerative braking has to be applied to a wheel that is driven, lest ride quality suffer due to the appreciable increase in the mass of the wheel, i.e., the “unsprung” mass. With cars, regenerative braking is typically applied to all-wheel drive vehicles, or to the front wheels of front-wheel drive cars, but indirectly in both cases. Regenerative braking could be applied indirectly to the rear wheels of a car that is rear-wheel driven, but there would be no strong advantage since traction at the rear wheel is lost during braking. As I think about it, I would not rule out the possibility that regenerative braking has been applied to the rear wheels of a car that is driven only at the front wheels, but if so, the energy recovery would not be appreciable, and the ride quality would suffer appreciably, because extra weight would be added to the wheels at the end of the car where front-wheel-drive cars are already too light from the perspective of ride quality. It occurs to me that there might be a practical way to apply regenerative braking to the front wheel of a motorcycle. In fact, I recall that I actually described this once somewhere, although I can’t recall where. The generator would have to be mounted on the chassis of course, which would mean that it would have to be hydraulically coupled to the front wheel. To avoid the hydraulic friction that would otherwise be present at all times, there would have to be a means by which the front wheel is disengaged from the hydraulic drive at times when braking is not being applied. This could be accomplished very simply, taking advantage of the fact that wheel torque is in one direction ordinarily and in the opposite direction during braking. I think that it could be made to behave adequately quick, so that the rider would not experience a delay in the application of braking. To avoid the need for a generator separate from the motor, a motor/generator would be needed, replacing the motor. It would also need to disengage from the hydraulic coupling to the front wheel, at times when braking is not being applied. When the motor converts to generator mode, it might also need to disengage from the rear wheel, to prevent the wheel from locking, since that tendency would likely be greater when the motor is intentionally caused to act as a generator. When I saw the link to howstuffworks, I cringed. I have yet to see a half-decent explanation of anything on that site, which exists for the express purpose of selling advertising. The explanation they have of torque and power is the most contrived pile of junk that I’ve ever seen. The motor/generator does not run “backwards”. Instead of converting electrical energy to mechanical energy, it converts the other way around, but it does run backwards. Toward the avoidance of a commutator, i.e., brushes, the generator is inherently an alternator. The alternative current is converted to DC via ordinary means for charging the battery, and the frequency of the AC current is of no concern. As long as the voltage being applied to the battery is greater than the battery’s opposing voltage, by the appropriate amount, energy will transfer into the battery as it charges and the desired effect of slowing the vehicle is accomplished. The voltage level is controlled by means of a variable transformer. An old-fashioned autotransformer would work except that the control arm would need to be driven either by a step motor or a servo-motor. The more difficult challenge is probably with getting an AC motor to turn at a frequency not synchronized to the frequency of the AC supply current. I suspect, but am by no means certain, that the solution here is to vary and control the frequency at the power oscillator where DC from the battery is converted to AC. Yes you are correct if you are using an AC motor. However, all of the electric bikes on the market I think use DC motors dude.. AC vs DC debate continues I guess. Edison vs. Westinghouse. No worries. Its just that whereas at face value the difficulty seems to be with how you get the electromagnetic device to apply the desired amount of braking, it occurs to me that this not likely the difficult part. That part is solved, I am inclined to believe, by careful control of the voltage presented to the battery, and most likely accomplished by some sort of variable transformer, which would apply prior to rectification and regulation, because transformers only work for AC (because the electric field by which voltage in induced in the secondary is in proportion with how quickly the magnetic field is increasing). Your reason for changing your mind is not the right reason. It might be possible to use a DC motor for a bike without regenerative braking, but the context of this little discussion, per Anothersquid’s question, is specifically about the use of regenerative braking, and this changes things fundamentally. The device known as a dynamo, which is a DC generator, is a historical artifact. I can’t say with certainty, but I doubt if any power generation at all is done with DC generators. They required a large commutator, and the brushes wear out and required periodic replacement. There is also the fact that the power grid and powered devices all assume AC, but this would not be a consideration in a contained application. It is nonetheless reasonable to assume that we are talking about an AC generator, and when it is operated as a motor, it would presumably have to operate as an AC motor. Therein, I suspect, is the real difficulty, because ordinary electric motors are synchronized to the frequency of the AC supply voltage. Previously I hazarded a guess that the frequency would be varied as need in the oscillator used to produce AC from the DC battery, but after doing a very brief investigation into this, it is likely the case that nowadays there are types of motors that are driven with AC but that are not synchronized to the AC frequency, but rather behave much the same as DC motors. Remember DC motors are smaller, cheaper, lighter, and have better speed control. Awesome looking. Love the concept. Not hard to believe Firestone motorcyle tires, they are owned by Bridgestone. Easy to change the mold to say “Fire” in place of “Bridge”.